The ladies at the Squam Art Workshops are keeping us in creativity by putting up the challenge to accomplish something on our lists by the end of March. My double dog dare, I suppose, will be to get this blog current by moving the content from my old site over… and post the dang knitting patterns over here. And… maybe do some sewing, which involves setting up my sewing area which I haven’t done since I moved. Sewing projects? a dress? I’ve always wanted to try jeans? or maybe upholster my reading chair? 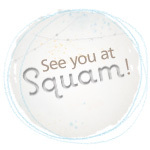 Thanks to the Squam people for keeping us with our eye on our work.